Do you need extra storage space in your home? Are you planning to move and need a place to pack items? Either way, SMARTBOX in Maryland, Virginia and Washington, DC can help! Our portable self-storage units are delivered right to your location, and you can keep them for as long as you need. You can pack your containers at your own pace, and we can move your container for you when you’re done. If simply don’t have enough space in your home to store all of your belongings, pack them up in our self-storage containers, and give them to us to take them to our facility for safekeeping. Whatever your self-storage needs in Alexandria, call SMARTBOX! For more information on our moving and storage services in Alexandria and surrounding areas, give us a call at 301-683-6111 or contact us online today! We deliver the SMARTBOX to your door with no stress on your part. You pack the self-storage unit at your own pace. No one is there to rush you or slow you down. If you don’t feel like packing the boxes yourself, we can provide professional movers to pack and load everything for you and at affordable rates! You can store the self-storage units at your place, or call us to pick them up and bring them back to our temperature controlled storage facility or directly move them to your destination. You can store with us as long as you like at our low monthly rate. You’ll save money and stress. When you are ready, you can let us know where you want your portable self-storage container delivered. We’ll get it to you; no stress on your part! We can move your self-storage unit across town or across the country. Almost anywhere you need to go, we can get your valuables there! With conventional self-storage facilities in Alexandria, you have to pack your car or truck with your stuff, travel across town, find your unit, unload your stuff, and then drive back to your home or office. With SMARTBOX, those days are over! Our unique portable self-storage units take the hassles out of the moving and storage process. Our self-storage containers can be brought right to you in Alexandria so you never have to drive across town. Another great advantage is you only pay for what you use. We can deliver as many units to your home as you need. You can then load and unload them on your own schedule. You can also avoid late fees and penalties you may get from other storage and moving companies in Alexandria if you choose SMARTBOX. Call us at 301-683-6111 today! Our portable storage containers are weatherproof, so you can leave them at your location in Alexandria without worry. If you would rather store them in our temperature-controlled facilities, we can bring them there for you. We will promptly pick your self-storage units up and keep your belongings safe and sound until you need them. Using our self-storage units is easy, affordable, and takes the stress out of moving (or that of living in a crowded home!). We’ll keep your valuables safe for as long as you need or we can transport your items to your new home. The biggest benefit of using our self-storage services is you can go at your own pace. Why hire a moving company that rushes you to pack everything up in one day? 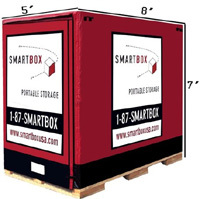 With SMARTBOX, you can take as long as you need, and we’ll come pick up your self-storage container when you’re ready. You can reserve self-storage units in Alexandria online, you just need to tell us how many SMARTBOX containers you need, when you need them, and where you would like to have them delivered. With SMARTBOX, you can get where you need to go at the pace you choose! To schedule your moving service or self-storage container in Alexandria with SMARTBOX, give us a call now at 301-683-6111 or contact us online!